It is the start of summer and the Raptivity team is very happy to announce its latest contribution to the forefront of interactivity with new enhanced features of Raptivity version 7.0 which incorporates various features based on the inputs received from our customers globally. We reckon to get you acquainted with them so that you have a brief overview of these features and use them to create engaging and interactive course content in minimum time and resources. Interactivity is a key component used to enable the learning process in the world of eLearning and mobile learning. However, if interactivity isn’t integrated into eLearning, the end user may not be able to experience learning as should be the case otherwise. That is one of the key reasons why Raptivity is always a favorite among teachers, course creators and instructional designers due to the easy user-interface and reduced turnaround time in creating interactions from scratch. 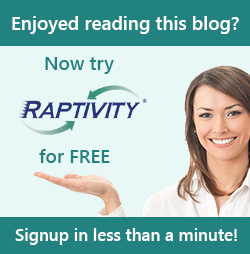 The devoted users would be overwhelmed with the new features of Raptivity 7.0. So, let’s explore it more with the help of a whitepaper titled “Lightning Tips on using Raptivity Effectively”. This whitepaper solely explains the six new features of Raptivity 7.0 and also provides handy step-by-step description for using them. These features have definitely passed all endurance tests before being offered to Raptivity users and would help in overcoming many challenges faced by teachers and instructional designers in developing highly interactive and engaging course material. We hope that Raptivity users explore and use these new features in varied ways for creation of interaction models. We are sure that our readers will be delighted with this new version of Raptivity and share it with their friends and colleagues. Download the whitepaper here and do share new ideas and suggestions by writing to our Program Manager at idea@raptivity.com .